Use our resources to understand the Genographic Project and ancient human migration. Couldn’t you look at this all day? Click to enlarge! Find the O2a haplogroup—that’s the population that fascinating new Genographic research has studied. To uncover evidence of an ancient migration pattern, scientists studied the DNA of a specific haplogroup (O2a1). 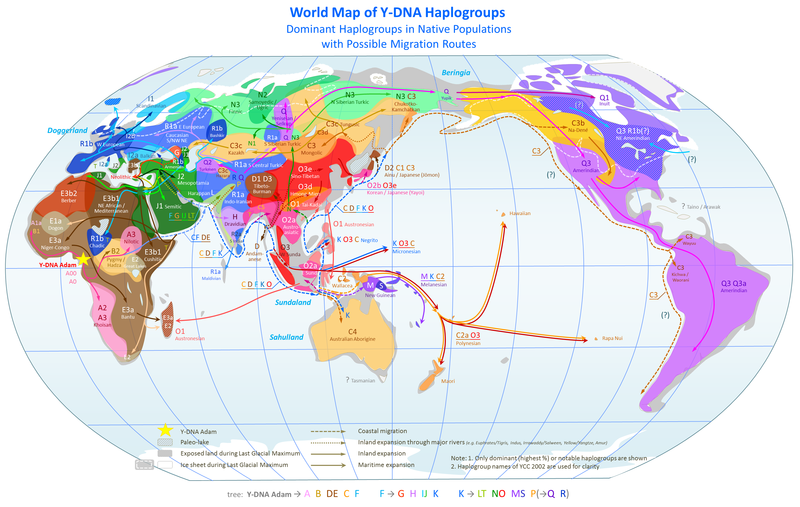 What is a haplogroup? A haplogroup is a group that shares a set of similar DNA sequences (called haplotypes). Haplogroups are used to understand genetic lineages. Learn more about haplogroups here. The map above shows some dominant haplogroups around the world. Geneticists who conducted the new research say they studied the O2a1 haplogroup because “it accounts for almost 15 percent of Indian male lineages and 58 percent of male lineages from Southeast Asia,” among other reasons. What about the women? What percentage of Southeast Asian women belong to the O2a1 haplogroup? Read through the terrific Explorers Journal blog post, then take a look at the map at the top of this post or the more simplified map of the “Global Human Journey” above. The migration pattern described in the blog post is a little different than what geneticists may have expected. What is the typical migration pattern in Southeast Asia? How is the new pattern different? DNA has shown that genetically modern humans left Africa around 60,000 years ago and went eastward into Asia. The new study shows that a population (the O2a1 haplogroup) migrated from what is now Laos and Southeast Asia westward—back to the Indian subcontinent. Take a look at the map at the top of this post. What type of migration routes do you think the ancient O2a1 population used in order to move from Southeast Asia to the Indian subcontinent? They could have followed overland routes, trekking through the lowland plains and forests of what are today Laos, Thailand, Myanmar, Bangladesh, and India. They could have followed rivers and their tributaries, such as the Mekong, Irawaddy, and Ganges-Brahmaputra. They could have followed coastal migration routes, navigating the northern shore of the Bay of Bengal, including the mighty Ganges-Brahmaputra delta. 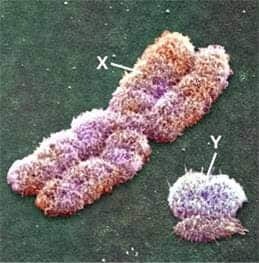 To assume there is only one source of human genome surely skews our research and makes us ignore possibilities of other centers of human population that could have evolved independently of others. Isn’t it possible for different groups to find and mix with each other later? I had had my DNA tested years ago for the NG genome project, but my daughter wanted to do hers to see what she inherited from her father. Turns out it was quite a bit more than I expected. 58% Asian and 4% Pacific Islander. On the program Finding Your Roots (PBS) Depak Chopra was tested as 8% Pacific Islander. Makes me very curious as to why they were migrating towards India and how widespread their descendants are. I had had my DNA tested through the National Geographic Genome project years ago but my daughter wanted to get hers done to see what she got from her fathers side of the family. Turns out she inherited quite a bit more from his side than mine. 58% Asian and 4% Pacific Islander. Depak Chopra was 8% percent Pacific Islander on his DNA results (Finding Your Roots-PBS). Really made me curious as to what would cause a migration from the Islands to India. We know all about LUCY…but the problem(s) of racisim white supremery still exist. One might think if we know we “all” come from one original source and are all brothers and sisters… what is the PROBLEM? Yet you have people saying ” im murican” ingonrance..
just because a few intellegent americans did this, doesn’t mean that the majority of the country isn’t ignorant, 60% of americans believe eveloution isn’t true and also, hate to point it out, but you misspelt ignorance…..
Sean, not sure where you’re getting your numbers, but numerous polls show all different kinds of results on belief in evolution, but I have yet to find one that says 60% of Americans do not believe in it. Unless you found a poll that was only taken in a rural, Southern area, you’re not likely to find those kinds of results. Also, if you want to pick on people for their spelling, I’ll assist you with yours. It’s “evolution”, not “eveloution”.